American transportation planners love to show off how creatively they can redivide the street lanes. They start with an ugly boulevard with four traffic lanes, two on-street parking lanes, and decaying sidewalks and give it a "road diet". Maybe the four lanes turn into three lanes including a middle turn lane, and that saved space becomes bike lanes and/or wider sidewalks. Likely also to appear are some bulbouts at intersections and everyone's new favorite, blinking amber pedestrian lights at otherwise unprotected crosswalks. In fact, this exact treatment has been taking shape on my local boulevard, Grand Ave in Oakland, California and throughout the country. Honestly, I just spent 30 minutes looking for photos of it, but the Internet isn't too excited about the improvements, so I had to find some older examples on Harrison St. and Broadway nearby. It's often hard to find pictures of street improvements in the US because they are so uninspiring compared to the newest neighborhood wood-oven pizza place or craft brewery. In fact, finding pictures of anyone enjoying freshly dieted streets is (un)surprisingly difficult, but coming across pictures of happy hipsters hoisting mimosas at the new brunch place is a cinch. In terms of our unbiased State of Place Index, road diets certainly help - points for bulbouts, reduced traffic lanes, better crosswalks, you bet. But having spent a lot of time in Europe, I find American planners are frequently obsessed with how to redivide the right-of-way, whereas European planners tend to think "outside the lane." Now, I admit Europe has lots of older, funkier street patterns that lend themselves to more creative transformations, but Europeans also don't bend to the rather naive idea of "Complete Streets" currently so revered by American planners. This ever-popular strategy espouses a "balanced", sharing-is-caring approach in which lanes for cars and parking, transit, bikes, and pedestrians are allocated "without judgement." It's a false equivalency not unlike how many in the media feel compelled to tell both sides of the story - even though one is clearly misleading or plain erroneous. So ultimately, under the guise of Complete Streets, planners typically produce streets in which cars still gobble up most of the street and everyone else battles for the crumbs - which leaves me wondering, so who exactly is dieting? Maybe It's OK to Be Selfish? Europeans are increasingly realizing that not every street needs car lanes, and shopping streets are certainly too important to waste space on parking. However, all streets (except for perhaps in industrial areas) need good pedestrian space and safe access for bikes. I was first delightfully dumbfounded by this "flipped-script" concept when I visited France's hallowed Chamonix under the Mont Blanc massif. The picture-postcard town tolerates cars but mostly caters to pedestrians and bikes, and presumably some cross-country skiers in the winter. Chamonix, France, gives vehicles and bikes a way through without slicing up the space into lanes. This intersection in downtown Oslo accommodates pedestrians, bikes, trams, buses and cars. The intersection was simplified by pedestrianizing one street, making another one way, and as a result maximizing pedestrian space. In effect it feels less like an intersection and more like a narrow asphalt street (though wide by Oslo standards). But people-first street treatments aren't unique to tourist towns in Europe. It's perfectly common to see streets turned into pedestrian areas with some allowance for vehicles throughout many cities in Europe. It might be that vehicles are only allowed at certain times of the day for delivery, or that they are allowed but made to curve carefully through areas that are designed for people. And naturally, these streets score very high on the State of Place Index, as they offer all kinds of pedestrian and bike amenities, have virtually no traffic lanes or parking, and still manage to attract a wide diversity of retail, office, and residential uses (in fact, these streets often command higher rents and per square foot revenues and values - as evidenced by our forecasting model). It made makes me wonder what we could accomplish in American cities if we stopped thinking of "Complete Streets" as well, that complete? What if Complete Streets weren't just about creating various subdivisions of parallel lines down the street and divvying them up between modes in a way that inevitably gives priorities to single-occupant vehicles (think of that ubiquitous picture going around Twitter showing the amount of space taken up by people, vs. bikes, vs. cars). I could argue that when we stop trying to "slice the cake" to create lanes for every mode on every street, and then ostensibly trying to "balance" out the portions, it leads to much more creative solutions. Let's take my neighborhood in Oakland, for instance. While there is a massive amount of new mixed use housing going up (thank goodness! ), some of our streets and intersections still look 1965, even as Whole Foods, bike share, the electric scooters, and tens of thousands of hipsters and the like flood into the area. Harrison St at 27th/Bay St is a monstrosity. The Whole Foods on the right used to be the power house for the cable cars at the turn of the last century, so the wide intersection is unsurprising. A quick and dirty reallocation of space. 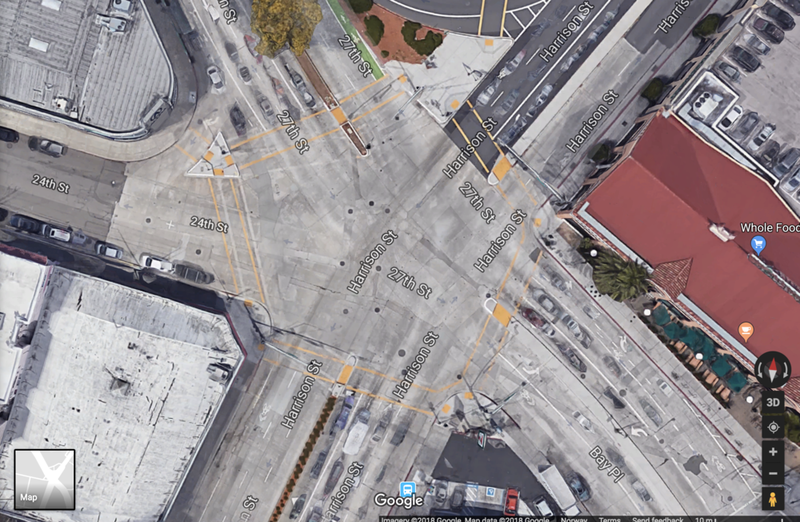 The intersection above, if given "complete streets" with bike lanes, would still be terrible. European planners would instead reduce most of the streets to two lanes or four with two dedicated to trams; they would close off the one unneeded through street (here 24th St) to cars, and turn this into a perfectly sane intersection with wonderful opportunities for outdoor dining and gathering spaces. 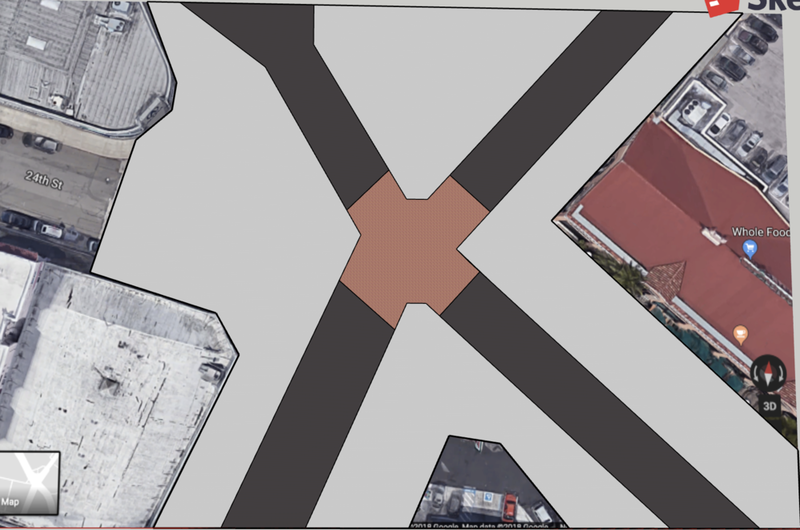 You can see based on this rudimentary Sketchup overlay, the European street design principles at play: maximizing pedestrian space, minimizing asphalt, and creating a comfortable place that can be crossed conveniently and safely. And those all important-seeming left turn lanes are actually redundant with other routing options. Some of the reallocated space could serve bikes and trams of course, but in general by allocating space for pedestrians instead of just dividing car, parking, bike, and pedestrian "lanes", we get a much better place. And I'm no traffic engineer, but I'm pretty sure these traffic lights would be a lot easier to program. Newer PostBack to Place School - Featuring William Whyte, My Consummate Substitute Teacher!